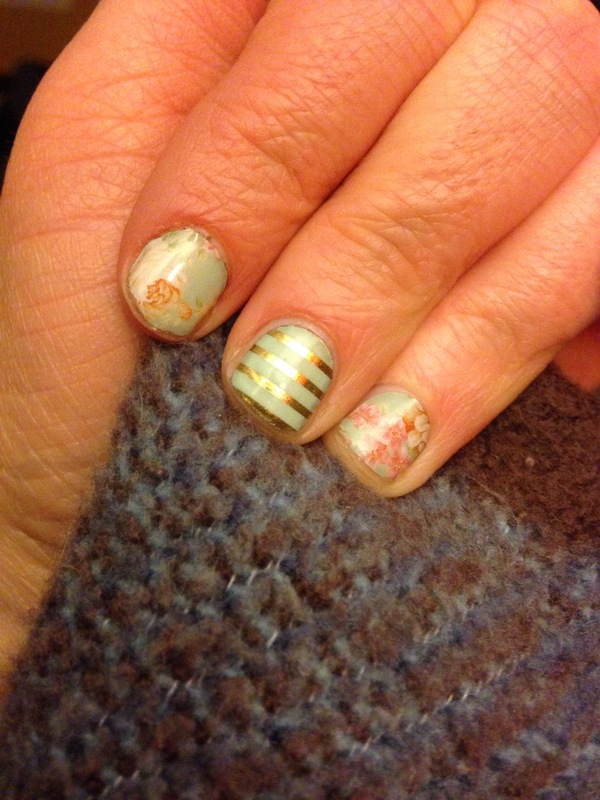 Last fall a friend invited me to an on-line “Jamberry” party through Facebook. For a week straight we played random games and won prizes. But the hook for me was Jam-Bingo. Yep, a live bingo where we picked our numbers beforehand and after the kiddos were in bed, the Jamberry consultant logged onto facebook and our thread of Jam-bingo became a series of numbers called. All these friends of mine started typing in responses of how many of their numbers were already called. First time playing, all five of my numbers were called so I typed Jambingo! I won a pedi-pack. I am always up for free things. I also booked a party with my sisiter-in-law and after all our free items and minimal spending I began my love for this product. 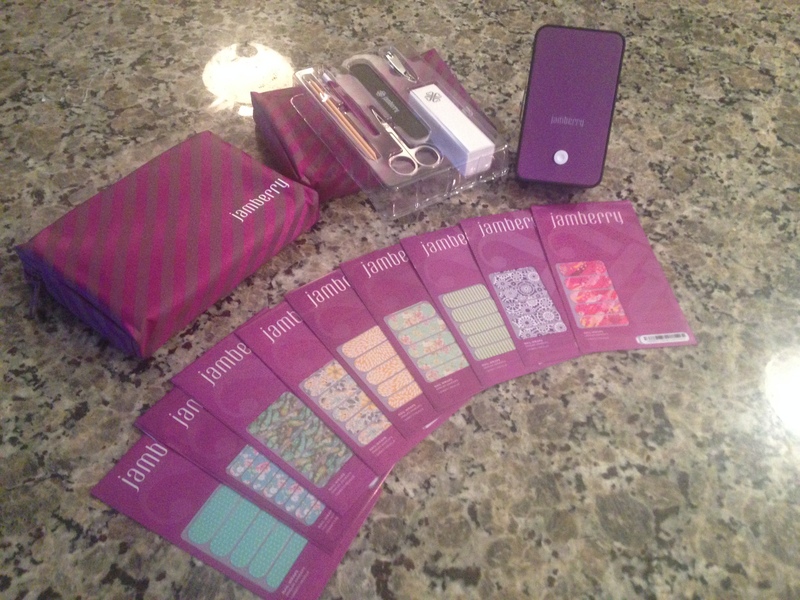 So by now, if you haven’t heard of Jamberry, you are probably like – GET TO THE POINT. 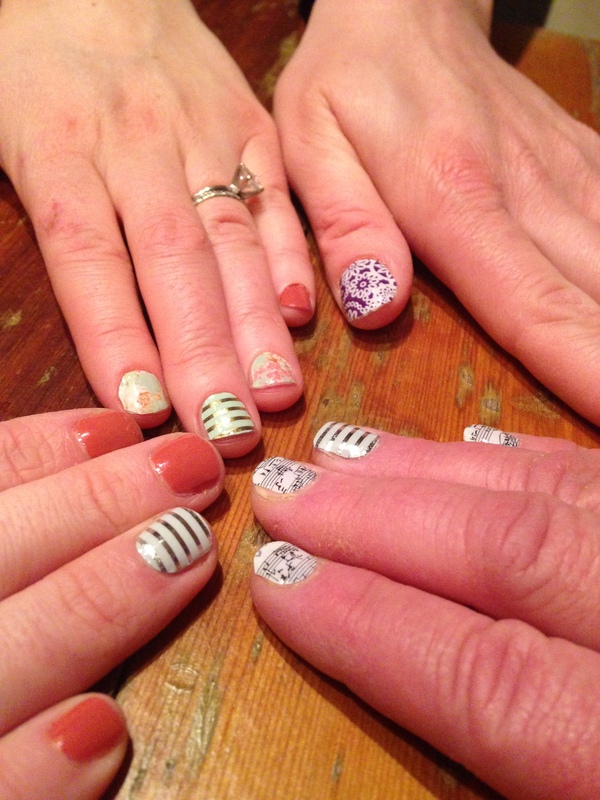 Jamberry is a company that produces, basically nail stickers. You cut them to fit your finger and with a little heat, apply. On my fingers they have stayed on for 2-2.5 weeks but on my toes more like 6-7 weeks. The first few times took some time but once you get the hang of it, it goes quicker. This is our winnings from my on-line hosted party. As you can see there are a variety of patterns and colors which makes it really hard to choose. And it looks nice to mix and match so I tried to pick some that can easily go togther. 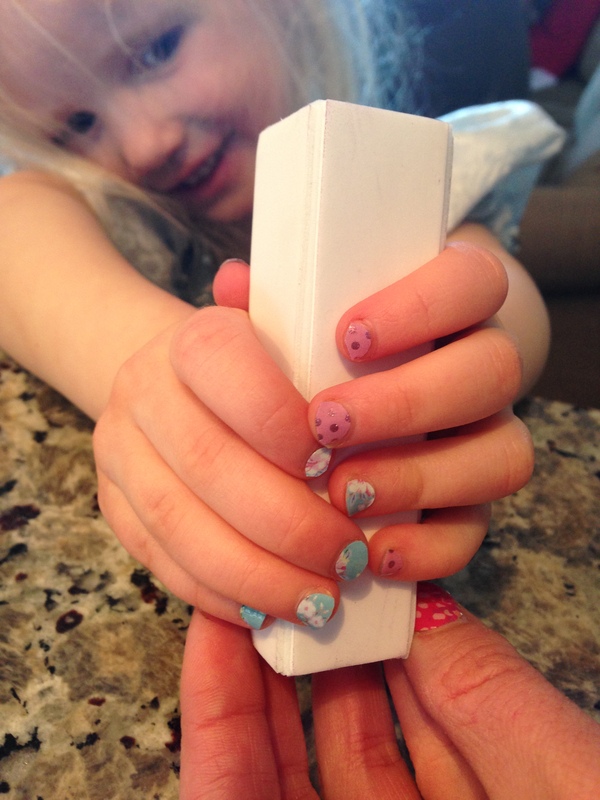 The cost for a sheet of nail wraps is $15 or buy 3 get 1 free (plus shipping). Each sheet provides you with 2-3 nail applications. $7 a manicure- I WILL take it! 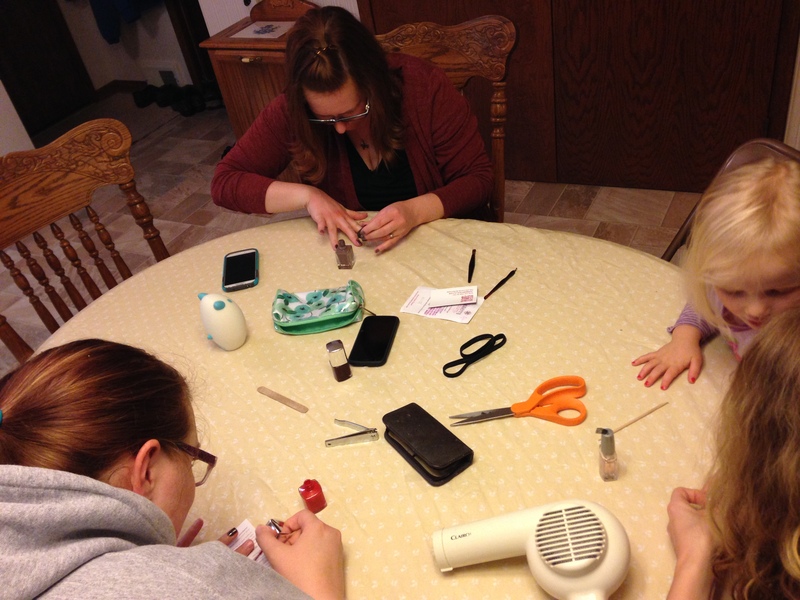 Here was the first time applying our samples with our cousins, Dynae and April. Needless to saw we all got hooked and April is even a consultant now! Most of the time, for sure in the beginning, we often did it all together in groups. All we needed were the wraps, scissors, nail file, nail clippers and a blow-dryer. Once we had our party I did buy a Jamberry mini heater, which works really well and is compact but not necessary. Here is what they looked like after 14 days. From a distance- great but up-close you can see the nail growth and edges. My cons to this product would be the upfront cost to get a few sets can be like $50. Initially seems high but worth it if you use them and even cheaper if you split them with a friend. The other thing I have noticed is they make my nails weak if I keep them on for 2-3 weeks and then reapply a new set right away. It almost seems better to wait a few weeks in between. Overall: I give this product a A. 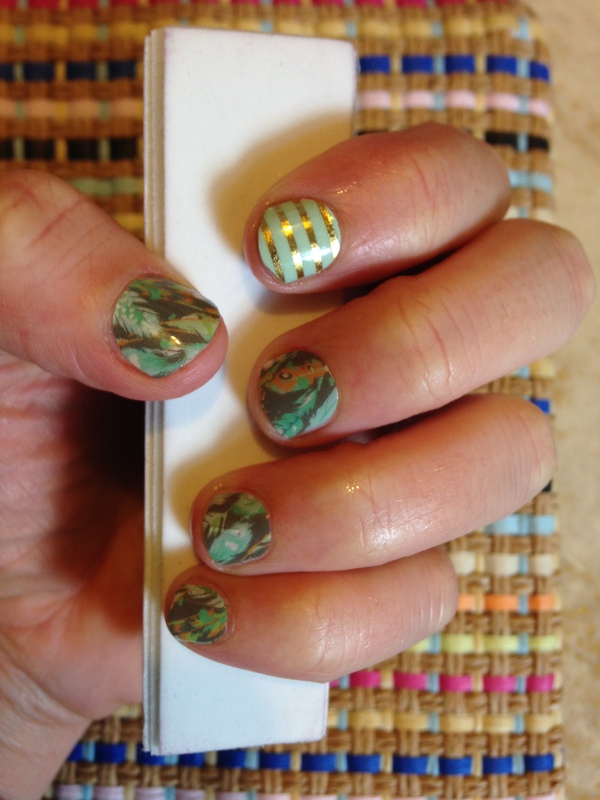 Great patterns, unique, lasts long and is cheaper then a mani or pedi. Plus with three sons, my daughter loves them and we can do this together! Happy Thursday and get in those pedicures one more time before winter!